PokerStars has introduced pot-limit Omaha Spin & Gos, so review PLO fundamentals and get in the game. It still feels like a relatively new addition to online poker, but the Spin & Go format on PokerStars has been around for quite a while now. First introduced in 2014, the fast-paced, three-handed tournaments with "lottery"-style prizepools have become a popular option for many players. Ever since launching, different stakes have been added and other tweaks have been made to the format. 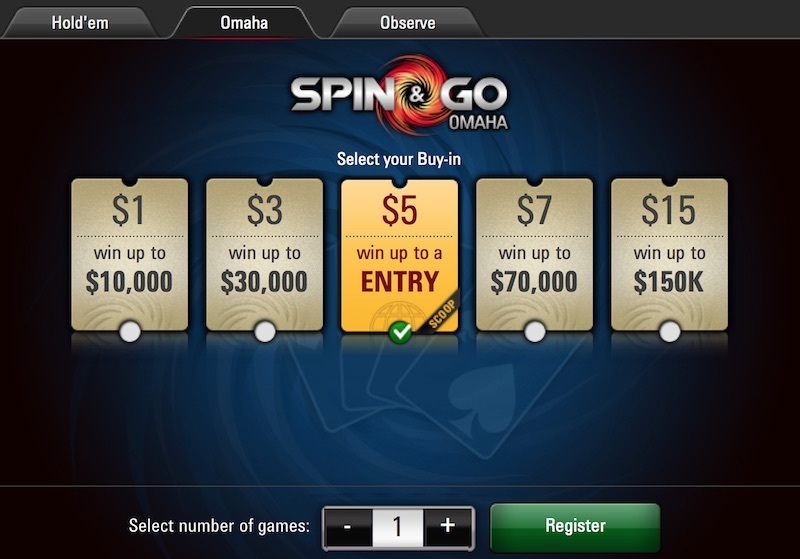 Starting this week Spin & Go players have another option available to them — pot-limit Omaha. 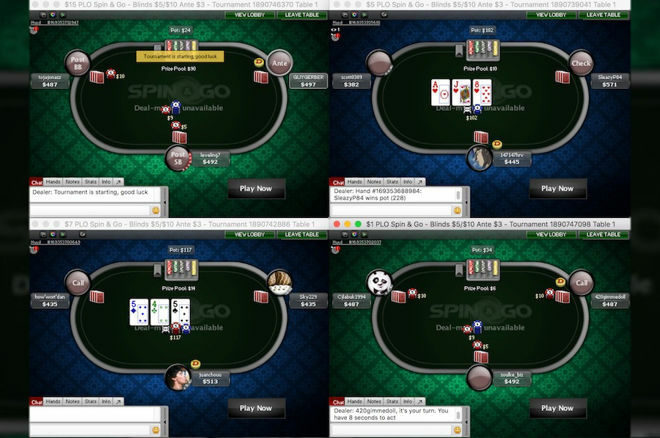 Currently PokerStars offers PLO Spin & Gos at buy-in levels of $1, $3, $5, $7 and $15. Like the no-limit hold'em Spin & Gos, the tournaments are three-handed hyper-turbos. The prize pool is randomly determined, ranging anywhere from two to 12,000 times the buy-in. To help celebrate the launch, the $5 buy-in PLO Spin & Gos currently feature either 2x prize pools ($10) or entries into the upcoming Spring Championship of Online Poker Event No. 5 on May 7 — either the "low" ($27 buy-in), "medium" ($215) or "high" ($2,100) version of the event. The Spin & Go format already encourages action. With three-minute levels and winner-take-all payouts, patience is hardly a virtue. In the no-limit hold'em Spin & Gos, players start with 500 chips with the Level 1 blinds at 10/20 — just 25 big blinds. Less than 10 minutes into the tournament they reach Level 4 (30/60), meaning if all three players are still alive the average stack is just 8.33 BBs. That means that aside from the first couple of levels, there isn't typically a great deal of postflop manuevering in NLHE Spin & Gos. Players who have become proficient at the no-limit hold'em Spin & Gos have a good grasp of "push-or-fold" strategy and employ it to good effect once the stacks become shallow. In NLHE Spin & Gos, the no-limit format allows for preflop open-shoves from the button or small blind. And with it always being either three-handed or heads-up, such shoving ranges should be very wide. Pot-limit Omaha is a game that also encourages action, although the pot-limit betting format means that in regular PLO games the all-ins often don't happen preflop but rather on the flop (or after). If the players are knowledgeable, you'll see less three- and four-betting before the flop in PLO, with players often preferring to close the action by calling raises, then seeing how well their hand fits the flop before committing more. When you're dealt in hold'em, you're happy to get all your chips in before seeing any community cards as you know that whatever your opponent has you are going to be around a 4-to-1 favorite to win. But in pot-limit Omaha, players often want to see a flop before committing their stack even with very strong starting hands. You often see the point being made about PLO that difference in "equity" between starting hands tends be narrower than in hold'em (although that isn't always true). So while is a better than 81 percent favorite over in hold'em, is only about 63 percent to win versus . Strong PLO players understand what starting hands tend to fit well with flops and become hands with which they want to "play for stacks." They also appreciate the importance of position, often a big factor postflop in PLO when it comes either to controlling pot sizes or getting those chips in the middle. These things matter in PLO Sit & Gos, too, but the fast-paced, shallow-stacked format forces us to think a little differently about typical PLO strategy. When it comes to PLO Spin & Gos, it's worthwhile to remember that during the first level or two — that is, before the stacks become so shallow that a preflop reraise will be an all-in (or close to it) — you will generally want to see flops and then decide whether you want to take your hand to the river. In fact, PokerStars gives PLO Spin & Go players an extra level when compared to the NLHE Spin & Gos. They still start with 500 chips, but the blinds start at 5/10. Somewhat strangely there's an ante, too — not typically used in PLO — which makes pot-sized bets and raises a little bigger than they normally would be. four consecutive cards or "rundown" hands; e.g. When seeing flops, you'll mostly want to pursue a strategy of betting when you flop a strong hand or big draw, and letting your hand go if you miss. Circumstances and particular opponents may dictate deviating from this occasionally (e.g., when against an obviously overly tight player who can be easily pushed out of hands), but for the most part there's not going to be enough time or chips to be bluffing or slow playing or being less than straightforward. What are strong made hands to flop? Flopping sets, flushes, straights, and even a lot two-pair hands will be good. In full-ring, deep-stacked PLO you might not be too eager to get it all in with bottom set or two pair, but in this hyper-turbo when it's two- or three-handed you can be. Learn to recognize flops that provide you big draws, too, especially those that give you a huge amount of equity, making you the favorite over even a lot of made hands. For example, you have and the flop comes — that's no less than 20 outs to make a straight, a big "wrap" draw with which it is worth getting in chips. These are just some initial thoughts to consider as you start trying out the PLO Sit & Gos on PokerStars. Play a few and get a feel for how they go, and develop your own strategies — and take advantage of those novice NL players jumping into pot-limit Omaha who haven't reviewed some basic PLO fundamentals beforehand.